You need help or have questions? 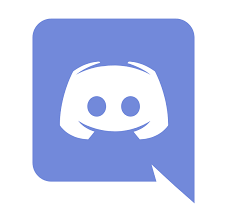 Join us on Discord. ACCIon is an RCON tool for the administration of servers that support RCON. Discord Bot. ACCIon transfers the chat log and the cheat logs to your Discord server. If you have the ionbridge, you can also send messages from discord to the servers. If you have Acmd you can also send commands to the server. Most extensions are already usable, if not in the description. However, they are still in the development phase and I can not guarantee the function or error-free function! With the benefit of this function and the patreon status, the further development and stabilization will be promoted! With the chat command Ion: it is possible to write cluster wide. e.g. Ion: Help a dodo bit me in the foot! will be read seconds later on all servers in the cluster. The IonBridge sends the command to all designated servers except the one from the message came. whether the bridge should be restricted to groups in ACCIon or works across all groups. You can also set whether the server name should be included in the message. The chat command Ion: can be replaced as required. More configurability when formatting the chat. AtlasDB is an extension that connects to the Atlas database. This makes it possible to expand the display of players in ACCIon. This will display the InGame name as well as the tribe name of the player. Display of the ships of the Tribes (number). Display of the positions of the ships. ArkDB is an extension that analyzes the file memory of Ark. This will display the InGame name as well as the tribe name and the level of the players. Since ArkDB currently requires a high level of configuration, it is planned to lower this. Another exclusively locally working version. 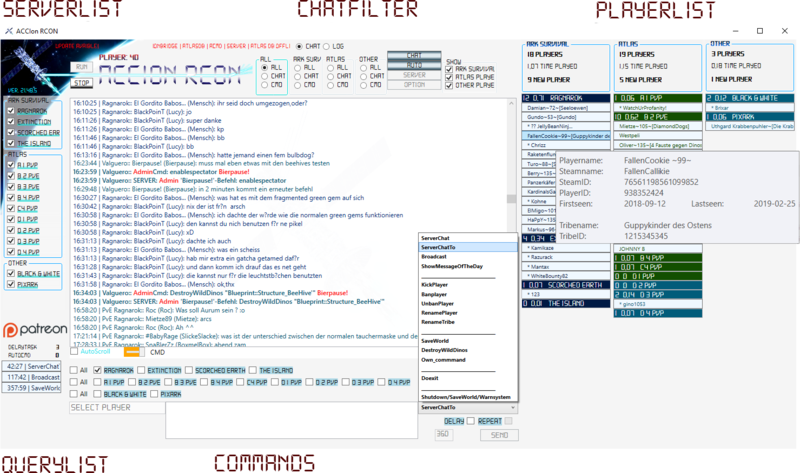 Acmd is an extension that allows Admins InGame to send RCON commands through the game chat. e.g. CMD: Broadcast The server got tangled in the power cable. Keep calm! The commands can optionally be sent to one or all servers. Any number of admins can be added or deleted via config.ini. More choice possible with the target servers. Self-determination of the command introduction "CMD:"
Server / Client is an extension in which it is possible to use the functions of ACCIon on several PCs simultaneously. There is a server version that distributes all logs and chats to each client. So it is possible that several admins can read the chats and logs without disturbing each other due to the RCON protocol. Development level at approx. 80%. Not usable yet. Tests have all been successful so far. Server number of ACCIon increase step by step to up to 100 servers. Depending on the support gets the priority. To use one or more extensions, you need to do the following. 2. Open ACCIon and there the options. 3. Click on the button below the Patreon picture. 4. Choose what you want to use. 5. Send an e-mail to the given address with your Patreon name and your ID next to the button. It takes a while, but then you should have the features you want.